Arrow Season 5 has now begun filming. The TV shows production team are dropping hints about what TV audiences should be expecting next season. We understand that District Attorney Adrian Chase AKA Vigilante, a DC creation who was chronicled in The New Teen Titans comics, will be joining the proceedings. He will be played by Josh Segarra (Sirens, Chicago PD). Rick Gonzalez (Reaper, Roll Bounce) is portraying another famed no holds barred street avenger in Wild Dog (Wild Dog #1, 1987). US Marine veteran Jack Wheeler was a Punisher style menace to criminals everywhere who became moniker-ed as Wild Dog. Canadian actress Carly Pope (24) has been cast as Susan Williams, a news reporter and sister in law of Hal Jordan, who is of course the original Green Lantern. Stephen Amell (Teenage Mutant Ninja Turtles), the actor who has inhabited Oliver McQueen for 4 seasons, has stated that some more characters from the comic world of Oliver Queen may be showing up and hinted that fans should expect a crossover with other DC originated TV shows. Shortly into the production of season 5, Amell is talking up the season’s premier episode (501) promising a darker, edgier Arrow in comparison to the previous series. He explained the season premiere further: “501 an opportunity for us to quite literally have the most, violent one shot -which is one cut – in the history of network television.” He insisted on performing his own stunts for the sequence. The first four seasons were all broadcast on the CW Network, in association with Warner Bros. Television. 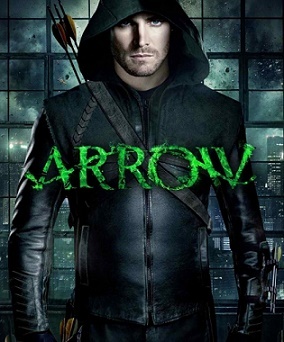 Arrow has sparked considerable popularity with TV audiences, the program fast developed its own fanbase. How long could Arrow remaining on our screens for? Amell is in no mood to hang up the green costume just yet, revealing that he is still contracted for a few more years.